The Guilford Social Services Department along with the VFW and Auxiliary, the American Legion, Guilford Rotary, Guilford Parks & Rec & Seniors and Guilford Food Bank work together to bring the Holiday Food Basket Program each season. Donations are collected just before Thanksgiving as well as Christmas. 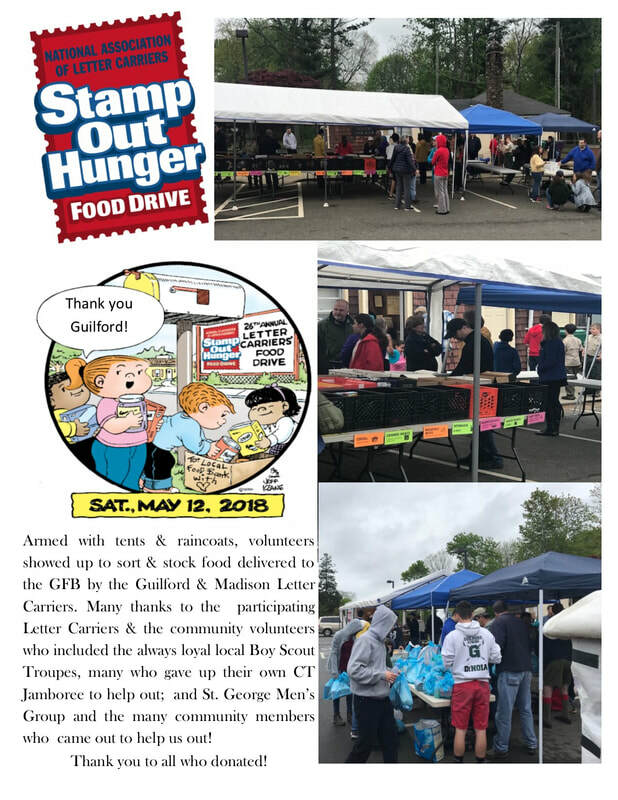 If your group or organization will be holding a food drive & donating large quantities and you wish to have the large quantity of items picked up, please assign a contact person and have them call the Guilford Social Services Department at 453-8009 to make arrangements. Volunteers are always welcome. The National Association of Letter Carriers Postal Drive is always held the Second Saturday in May. Many volunteers are always needed for this huge event and are very much appreciated. If your group or organization would like to hold a food drive for the Guilford Food Bank, please contact Guilford Social Services at (203) 453-8009.